Coldplay’s single, Viva La Vida, released in May 2008, has become their biggest hit, helped along no doubt by a special release music video on iTunes and two promotional music videos directed by Hype Williams and Anton Corbijn. Viva la Vida was the second single from the Viva la Vida or Death and All His Friends album. The single and album take their name from a painting by Mexican artist Frida Kahlo. “Viva la Vida” was initially released only with iTunes Store pre-orders of Viva la Vida or Death and All His Friends on 7 May 2008 as the “New Edit” of the song. The song was used as part of Apple’s iPod + iTunes advertisement campaign in May 2008. Although the commercial was only 30 seconds long, it has raised expectations of the official music videos that in many cases led to disappointed fans. The ‘Sonic’ Coldplay ad was developed at TBWA\Media Arts Lab, USA by chief creative officer Lee Clow, executive creative director Duncan Milner, creative director/copywriter Eric Grunbaum, creative director/art director Scott Trattner, and senior agency producer Mike Refuerzo. Filming was shot by Mark Romanek/Logan via Anonymous Content with director of photography Adam Kimmel. Editor was Glenn Martin at Nomad Editing Company. Visual effects were developed by Mork & Lys with lead compositor Brandon Sanders. Post production was done at Company 3 by Stefan Sonnenfeld and Brian Robinson. The first music video for “Viva la Vida”, directed by Hype Williams, was released on Coldplay’s official website in August 2008. 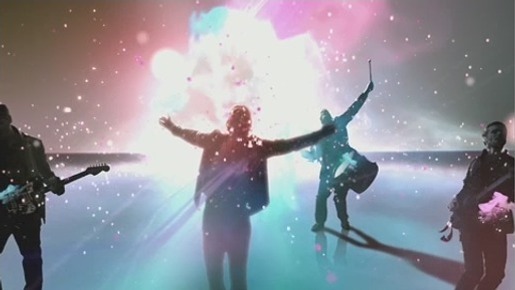 The video features the band performing in multi-colour backgrounds, with artwork from the album interspersed with speeding clouds and rose petals. Filming was shot by director/editor Hype Williams via Natalia Pictures, with director of photography John Perez, art director Gregory de Maria, executive producer Scott Pryor. Post production was done at Resident by Flame artists Claudia D’enjoy, Martin Lazaro, after effects team Gregory de Maria, Andrew Hamilton, Dimitri Luedemann, Francis Oh, Erik Rasmussen, Cory John Staffa, Adam Vandine, Maya artist Orges Kokoshari. Anton Corbijn filmed Coldplay in the Hague, the Netherlands, for the second music video, released at the same time as the first. The footage is a tribute to Corbijn’s video for Depeche Mode’s “Enjoy the Silence” and portrays Chris Martin as the king from whose perspective the song is sung. During the video, he carries a larger framed version of the cover art for the album. At the end, we see him hang the picture up in a white stall on top of a hill. As he sings the last chorus, his band mates surface heading his way, tying in loose ends from the Violet Hill video. Corbijn worked with producer Kees Kasander and Kasander Film, and editor James Rose at Cut + Run.